A part of me just wanted to test myself, because I love a good challenge, while the other part of me was really worried that I wouldn't be able to do it. After getting an MPH in Global Health I knew that there was so much more to becoming a conscious consumer than just paying attention to where my food was coming from, and after I switched over my skincare to safe-products I knew that I was ready for that next step - my clothing. I started by just educating myself on our fast-fashion industry. I knew that we no longer were living in a fashion cycle with only four seasons, but I had no idea that fast-fashion now existed on a 52 season model. Meaning that you as a consumer could purchase something new every single week. So did that mean that enough people were purchasing all the clothing in stores each week to make room for the new clothing? And how big were their closets if that was the case? The answer is, absolutely not. To make room for the "new seasons" many fast-fashion retailers have been known to destroy and discard the previous "seasons" clothing to make room for the new week. I also began to educate myself on the occupational health hazards associated with the fashion industry (which were very similar to the food industry), and the various ways in which the fast-fashion industry was impacting the environment. As someone who #1 is an environmentalist, #2 is a global health professional and #3 is a passionate humanitarian I knew that the moment I had this information I wouldn't be able to look back. That is just how my mind works, for better or for worse. I am going to take the time to share with you more of the educational information I have learned since I began this journey and started working with sustainable fashion retailers to help change the global health implications of our fast-fashion industry. But for now I want to just share with you a few of the things that happened to me personally when I stopped shopping fast-fashion. Maybe after hearing my story you will become inspired to do a fast-fashion detox of your own. Once I decided that I was going to stop shopping fast-fashion for at least one year I knew that I was going to need to have a game plan. Your initial reaction when you begin down this path is to throw out all your "fast-fashion" clothes, but that actually would be far more wasteful than helpful. The damage has been done, now the goal is to increase the lifespan of that "fast-fashion" item for as long as possible. So I went into my closet and did an immediate hard-edit of all the clothes I had. I literally pulled everything out of my closet and bureau and made three piles. Note: I do not donate my clothes except for very specific occasions, which I will discuss at another time because that is a whole post of its own. I placed the clothes that I would sell online (I use poshmark, you can check out my closet here) in a large bin, and then put the rest of my clothes back in my closet with the goal of doing the same edit again every three months until I only owned 80% clothes that I would wear frequently and 20% clothes that were fun and for special occasions. Once I opened my eyes to the world that is sustainable fashion I discovered that there are so many amazing small (and large) brands and individuals doing incredible things and making absolutely beautiful clothing. Some of these designers were totally out of my budget, the way other fast-fashion designers had been as well, but others were about the same price as some of my previous favorite brands like anthropologie, free-people, and madewell. For the brands the were out of reach, I started looking for them on second-hand sites like poshmark, tradesy, or threadup to see if I could snag a good deal! While I was never a big "shopper" per say, I definitely would use shopping to take up time with the people I love or to make me feel better if I was having a bad day. For instance, if friends came into town, or if I spent the day with my Mom a lot of the time we would do a little shopping, in addition to something else that was active or food related. I would plan more outdoor adventures with my friends/family, would do more coffee dates with my sister, take more walks or go for runs with friends, and go paddle boarding more in the summer. There were about a million different options that didn't require me to ever spend quality time with my friends and family in a Nordstrom Rack, and once I realized that I truly didn't have any desire to step into a Marshalls, Home Goods, or Nordstrom anymore I can't even tell you how freeing and empowering that feeling was. Yes you heard that right. I literally saved thousands of dollars last year by not shopping fast-fashion, and buying (usually) more expensive sustainable fashion clothing items. I had no idea how much all those $10 dollar H&M shirts, $40 on sale Madewell Jeans, and $25 dollar dresses really added up over the course of the year. If I wanted something new I had to look in my closet and honestly ask myself if I really needed it. If the answer was yes then I had to search for a sustainable option on either a sustainable retailer website or on a secondhand website. After this much thinking and searching 9 times out of 10 I would decide that I actually didn't need the new dress. Guys, we went to 10 weddings last year and I didn't buy a new dress for a single one! That alone saved me hundreds and hundreds of dollars because I was able to accept that literally no one cared if I had worn this dress to another wedding, and I felt great because I had already worn the dress before, knew I loved it, and knew how to style it. This also made it entirely guilt free when I would choose to buy something new because I knew that it was inline with my values, supporting a more sustainable fashion industry, and was something I had really taken the time to think about. What I realized after looking back on the previous few years, was that even though I still didn't think I shopped fast-fashion a whole lot, I shopped it enough to where I was able to save $2500 even after my sustainable shopping purchases. I also made $2500 last year on poshmark selling my gently used clothes that I decided I didn't want to keep in my closet. So if you add that to my shopping savings I saved $5000 just by not shopping fast-fashion last year! Once I choose to stop shopping fast-fashion all of my impulse shopping went away...overnight. Because most sustainable fashion retailers aren't available as you are walking down the street on your way home from work every day, that desire to impulse shop became a lot less. Additionally, sustainable fashion retailers can't do as many sales year round because they need to make sure they are supporting an ethical supply chain, which means that they cant make as small of margins like some of the other fast-fashion retailers who aren't paying their workers fairly. Impulse shopping, at least for me is much harder when the total cost is higher. Which meant that I did far less online impulse shopping as well. Probably the best thing that happened though when I stopped shopping fast-fashion was that I become more in-tune with my own personal choices, and personal responsibility than ever before. I felt so empowered by my actions, how they were starting to rub off on my friends/family, and truly became so motivated to keep going because deep down I knew that it was the right thing to do. You already have! Just by reading this post of mine you have chosen to start to think a little bit differently about the way you participate in our fast-fashion industry. But if you want to go a little further here are a few things I recommend. First, read these posts that relate to this topic below. 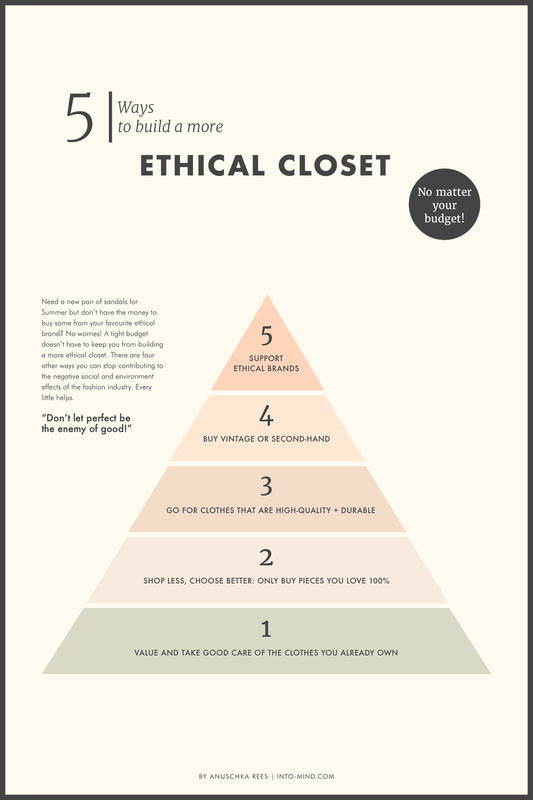 Next, take a look at the graphic below for 5 ways that you can start to build a more ethical closet of your own, no matter what your budget is. Notice that you can start with the largest category, which is to take care of what you already own. Lastly, I would recommend watching The True Cost documentary, and do a little journaling after to determine where you feel you are at when with comes to your fast-fashion consumption habits, and identify what areas you think you are willing and able to improve upon right now. Remember, this isn't a transition that happens overnight, it takes time and no one is perfect. But working towards a better system is an incredible thing, and anyway you choose to support that is something you should be proud of. Up next for this topic, I am going to share with you exactly how to get started transitioning to more sustainable fashion based on my experience and all of your questions. I also am going to be launching a resources page for all my favorite brands etc., to make the process a whole lot easier. I know for me one of the most overwhelming parts of this transition was finding alternatives to some of my favorite brands that I no longer would be shopping.